No discussion of the personal finance environment would be complete without considering government, especially its economic attributes and their impact. A good place to start this explication would be with defining public goods. These are items whose consumption is not decided by the individual consumer but by society as a whole, and which are financed by taxation. Public goods (and services) include national defense, law enforcement and courts, national parks, economic statistics and other information, etc. No market exists for such goods, and they must be provided to everyone by the government. The take away from public goods is they need to be financed and that financing means taxes. More public goods and services mean more taxes. More taxes mean less money for you. It’s just that simple. This is not political but it does have important economic ramifications because government is not the most efficient user of scarce capital but that’s a subject for other posts. Pretty much every transaction we enter into has a tax associated with it. If you earn money working you’ll pay income and social security taxes. Investment income, income tax. Depending where you live you’ll get to pay income tax to the US government, most states, and in many places your city or town. If you buy something you’ll pay sales tax. Own a home you’ve got real estate taxes. Drive a car pay licensing fees. Give a gift, gift tax. Die and leave the money to your heirs an estate tax. Depending on how much you make a dollar of gross pay translates into as little as a $0.50 net dollar. 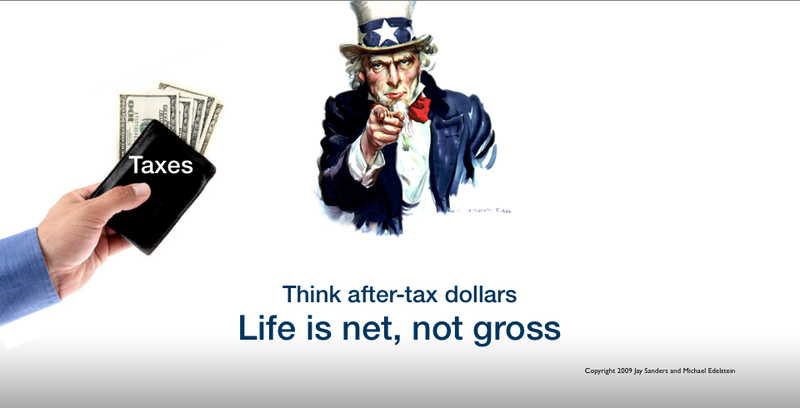 The bottom line is you need to be conscious that life has to be financed after tax, net not gross. You don’t pay your bills with gross dollars, you pay them net. This entry was posted in Financial Literacy Basics, Personal #s and tagged Financial Literacy, Financial Planning, Money Management, Personal Finance, Personal Financial Planning, Retirement Planning. Bookmark the permalink.